Factual error: House and Foreman tell the Senator that he has toxoplasmosis, which is caused by a fungus. Toxoplasmosis is actually caused by a protozoan parasite. Factual error: House is playing 'Metroid: Zero Mission' on his Gameboy at various times. The Metroid series does not feature space monkeys, nor are there distinct levels. The sounds coming from the game in the show do not match it in real life, and Samus morphing into a ball is most definitely not a failure state. Continuity mistake: As House describes the lady's symptoms, in the front shot Chase has a small book/pamphlet in his hand. The camera changes to a side shot in the middle of House's description and suddenly the book is on the table and no longer in Chase's hand. This happens right in the middle of House's line and Chase doesn't make any quick movements to account for this discrepancy. Character mistake: Episode 6.12, Moving The Chains: Marcus tells House that he and Eric were arrested for stealing a car, he was 16 and Eric was 14. He also says that his brother never did anything criminal after that. In season 1, we were told that Eric was 16 when he was arrested for stealing a car. Continuity mistake: The text with the symptoms written on the board changes several times, watch the letter F on the left. Sometimes it has a line across it, sometimes not. Continuity mistake: When House is talking to Luke about the Vitamin K deficiency and eating the hamburger, the lid on the ketchup bottle is closed on the shots facing House and open on the shots facing Luke. Revealing mistake: All the babies in the incubation room are, very evidently, dolls. When one is driven inside, his cries are heard but he doesn't mouth them. Continuity mistake: As Cuddy is making the deal with House, how much time off from Clinic duty for a week off his vicodin, while the camera is behind Cuddy you can see there is bright sunshine on House's head. The shot switches to a camera behind House and now his head is shaded. Continuity mistake: Most of the time, whenever House puts down his Nintendo DS, the angle at which it is bending changes. For example, in one shot, it is not bent at all and in the next it is almost closed. Continuity mistake: When Robert is telling Allison about the sexual life of the patient, her reflection shows her turning around. When the shot changes, she is back in place repeating the movement. Continuity mistake: Chase is 26 years old in season one. In season two he's 30. Continuity mistake: House is about to inject Ezra Powell (Joel Grey) with what is supposedly a lethal dose of morphine. In the shots where they pan out to show House addressing the room at large, the syringe is very full, almost completely. When they zoom in on House holding the syringe, it is only filled a fraction of that much - maybe a quarter to a third. This doesn't happen just once, but every time they switch between shots. Continuity mistake: Season 6 - Ep. 6 Known UnknownsBefore House goes to the hotel he's out on the street and the collar of his shirt is up during all front and back angles, except for a brief single back angle where it's down. Then it changes to up again. 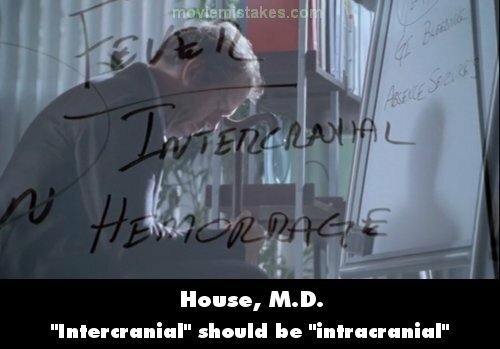 Continuity mistake: Dr. House is listening to a patient's heart with a stethoscope. However as the shot cuts to his face you can see the stethoscope is not in his ears. Factual error: In episode 414, "Living the Dream," the patient Evan is given a nerve function test. We see Kutner and Taub performing the test by puncturing Evan's legs with needles. Modern nerve function tests actually rely on electrical impulses from a small computerized device, with no needles necessary. Continuity mistake: Foreman is doing a sonogram of Mary's brain. As she comes out of her absent seizure Foreman's probe jumps from the left side of Mary's head to her right. Buy the booksMost popular pagesBest movie mistakesBest mistake picturesBest comedy movie quotesMovies with the most mistakesNew this monthFight Club mistakesPretty Woman mistake pictureThe King of Queens mistakesDjango Unchained endingGrease questionsThe Passion of the Christ triviaStep Brothers quotesThe Truman Show plotMel Blanc movies & TV showsThe 20 biggest mistakes in Jurassic ParkGladiator mistake videoMore for House, M.D. House: As long as you're trying to be good, you can do whatever you want. Dr. Wilson: And as long as you're not trying, you can say whatever you want. House: So between us, we can do whatever we want. We can rule the world! 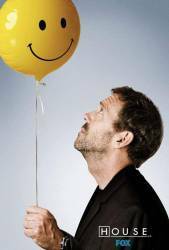 Hugh Laurie auditioned for the role as Dr. Gregory House in his hotel room bathroom in Namibia. He was rehearsing his role for the film The Flight of the Phoenix and claimed that the bathroom was the only place with enough light. He also apologized for his appearance on tape before the audition as he'd just come back from filming. The fact that House has a somewhat scruffy and unkempt look, particularly his constant five o'clock shadow, has been attributed by creator David Shore to Laurie's appearance in this audition tape.